For the British, 1759 was indeed the “year of victories." Triumphs were reported from India, Africa, the West Indies and on the high seas. In North America, Forts Niagara, Ticonderoga and Crown Point fell, but the crowning achievement was the French loss of Québec. 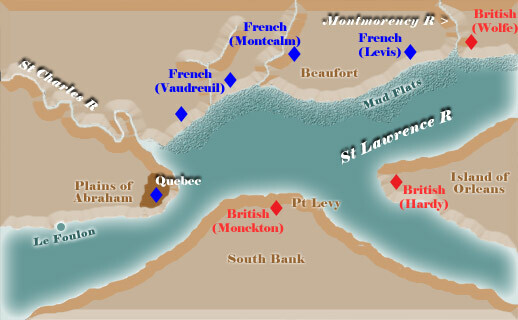 Combined army and navy forces were to be assembled in a fleet and sent up the St. Lawrence to besiege the key French bastion, Québec. In June, the plan was implemented. William Johnson ’s army successfully captured Fort Niagara and the forces of General James Wolfe and Vice Admiral Charles Saunders arrived at Québec via the St. Lawrence. Jeffrey Amherst took the abandoned and destroyed French positions on Lake Champlain in July and August, but then dedicated his efforts to reconstruct those forts rather than push on to join Wolfe in the Québec offensive. The arrival of the 200-ship British fleet outside Québec was in itself a minor triumph. The passage up the St. Lawrence was difficult for large ships, but was accomplished without loss. An initial position was taken on the Island of Orleans, east of the city. The task facing the British was daunting. Located high on a bluff above the swiftly flowing St. Lawrence, Québec appeared to be an unassailable fortress. The defenders, numbering more than 14,000 men, were confident that 180-foot cliffs made it impossible for an invading army to make a direct assault, while rivers and tide flats made the approach from the east unlikely. To guard against an overland advance at Beaufort, the north bank of the river, the French deployed the bulk of their force there, including the forces of the Marquis de Montcalm. Québec itself was defended by combined French regulars and Canadian militiamen. Wolfe then split his forces; some remained in place on the Island of Orleans, while others under Robert Monckton occupied Point Levy, an undefended position on the south shore. From there, British guns were capable of reaching the city's lower portions. Intermittent shelling of Québec continued throughout the summer, but the British failed in their efforts to discover a means of breeching the French defenses. In September, in a stroke of extreme good fortune, Wolfe learned of the existence of a steep path that ascended from the river to the Plains of Abraham outside of the city. Some authorities have reported that his vital information was provided by Wolfe’s scouts, but others have suggested that the path was identified by a disgruntled Québec resident. Seizing on this thread, Wolfe devised a new war plan that was put into action on the 12th. He first ordered the bombardment of the Beaufort shore, then loaded landing craft with soldiers and put them ashore east of the Montmorency River. Next cannon fire was directed against the city from the British battery near Point Levy. Finally, a portion of the British fleet sailed past Québec and appeared to be headed for Montreal. The impact on Montcalm’s command was one of confusion. The bulk of the French forces were deployed along the Beaufort heights in anticipation of a British assault from the east. Under the cover of night, British forces quietly converged off of Le Foulon. Small boats ferried more than 4,000 soldiers ashore. At 4 a.m. on the 13th, a scouting party ascended the pathway to the top of the cliff and dispatched the single French sentry. When dawn broke a few hours later, the city was greeted by the spectacle of a British army in battle formation immediately outside its walls. Montcalm tried to gather his widely dispersed army, but by 10 a.m. made the premature decision to confront the British army with whatever soldiers were at hand. The great battle on the Plains of Abraham lasted only 30 minutes; British ranks held firm in the face of a French advance. A devastating volley was fired when the British musketeers could see the whites of the French soldiers’ eyes. Huge numbers of men were mowed down and many others broke ranks and fled. A British counterattack quickly ended the battle. Both commanders were struck down; Wolfe lived long enough learn of his victory and Montcalm died from his wounds the next day. The risk that Wolfe chose to undertake cannot be minimized. If Montcalm had not taken the bait and engaged in battle on an open field, then the British prospects would have been extremely grim. Ice would soon have closed the St. Lawrence and the prospect of marching an army southward to the colonies was equally unappealing. For all intents and purposes, the British victory at Québec spelled the end of New France, although Montreal held out for another year. Pox Americana: The Great Smallpox Epidemic of 1775-82 by Elizabeth A. Fenn.